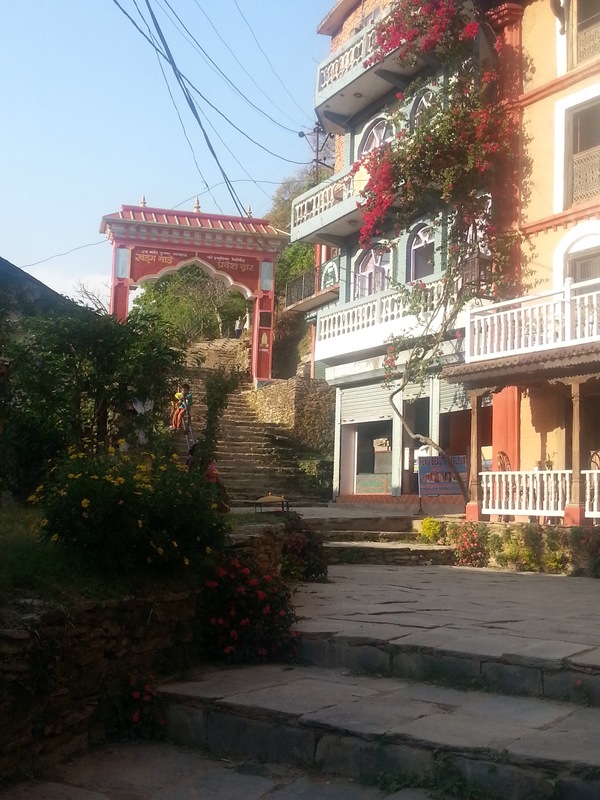 Bandipur is a little town halfway between Pokhara and Kathmandu. 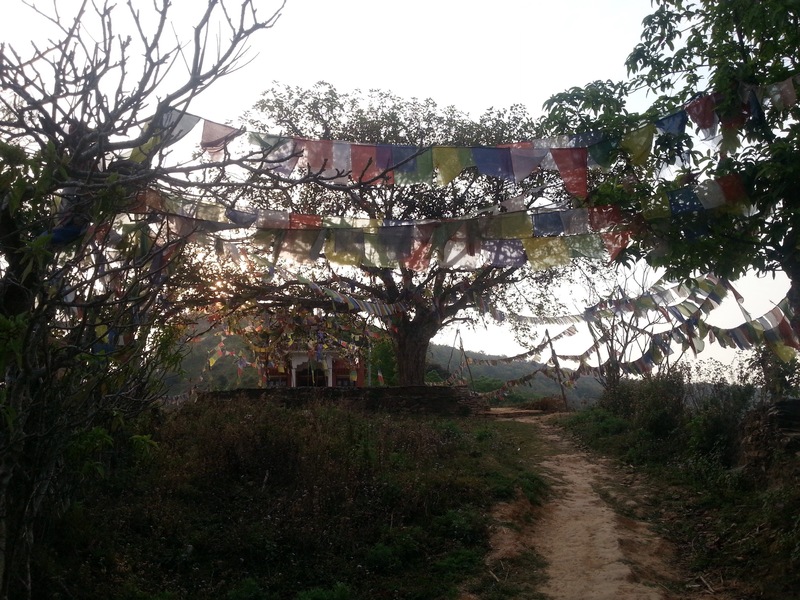 You have to tell the bus driver you want to get off at Dumre, and then you catch the local bus (takes 15 minutes, costs 50 cents) up to Bandipur. We did a “homestay,” so essentially we stayed with afamily who had converted some of their rooms to hotel rooms. It was rustic; the bathroom was in a hut outdoors, and it was basically a hole in the ground, although the Wi Fi was better than in Kathmandu. Bandipour is a rustic town with a beautiful town square, and the main activity is hiking. The air seemed practically delicious after the smog of Kathmandu. There were chickens, goats, stray dogs and buffalos everywhere. 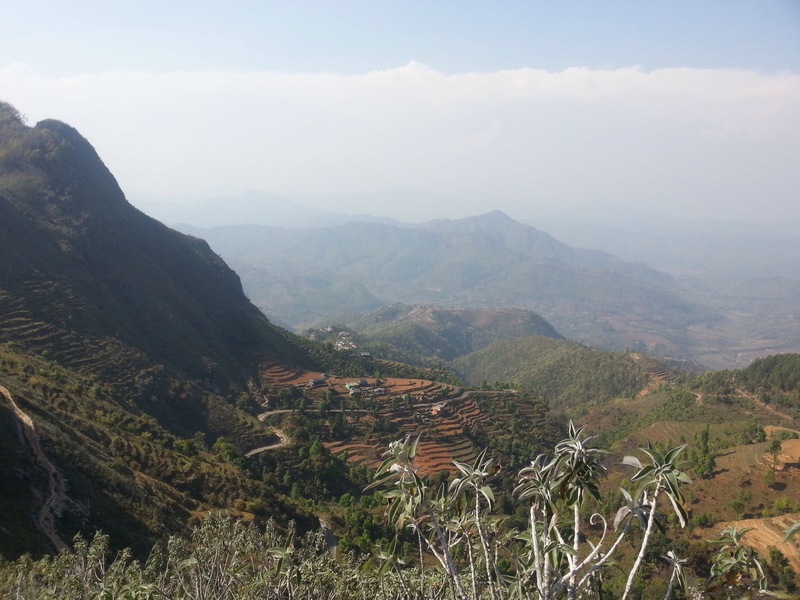 The sound of goats bleating at each other carried across the valleys and ridges. On our way back from dinner, we kept commenting on how dark Bandipur was. There weren’t even streetlights, just a few lights in stores or restaurants. When we got back, we realized that the power was out. Our host brought us a candle for our room, and then by some miscommunication her daughter also brought us a candle. She returned shortly thereafter to demand one of the candles back. One candle per room, apparently. After a morning hike and a delicious breakfast featuring buffalo milk lassis, we were headed back to Dumre to catch the bus. We ended up waiting for two hours, because the driver refused to leave Kathmandu until all seats were filled. According to the person we spoke to, it took over an hour to fill that last seat. Our bus to Pokhara was a Nepali tourist bus, not a tourist bus, so it was smaller and more cramped, though not as small as a local bus. The two Nepali guys sitting next to me had trouble staying quiet. They said that Nepali buses are always very noisy, with lots of people singing and talking, but Westerners don’t like that and he was trying to be respectful of that, since Westerners made up the majority of the bus. But he couldn’t seem to help singing to himself and tapping rhythmically, despite the glares of the German tourists in front of him. And then we were in Pokhara! We walked to our hotel frmo the bus station, only to discover that our map was wrong and we were actually at “Hotel Mountain Home” not “Hotel Mountain View.” We decided to stay, and fortunately they had room for us. This ended up being on of the best “accidents” to happen to us, as the hotel was wonderful and we met the hotel owner’s daughter, a Nepali woman who had majored in English literature. We spent hours talking about books and poetry, and promised to stay in touch. I hope we do! 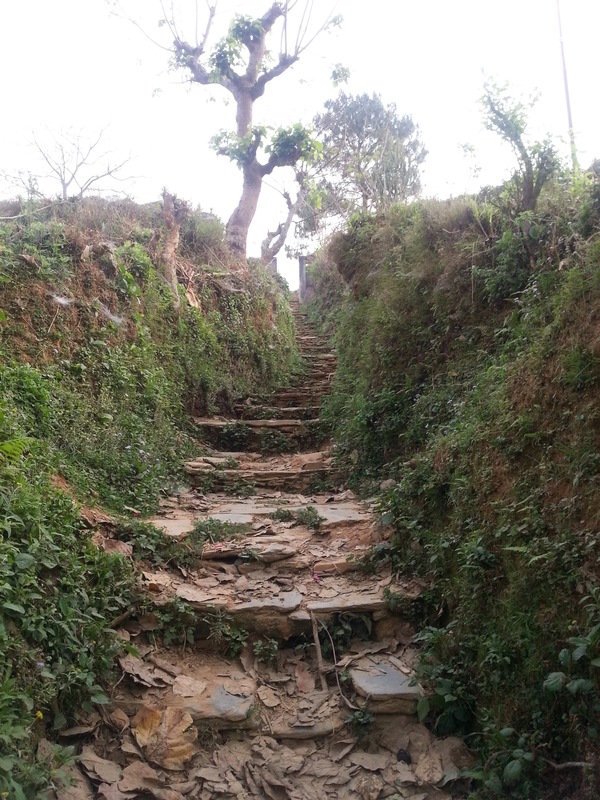 This entry was posted in Nepal and tagged Bandipur, Nepal. Bookmark the permalink.